I’ve heard of life imitating art, but news that one of Europe’s major capitals is to use a video game to plan out an entire new district that people, real people, will have to live in somewhat takes the biscuit. Fancy yourself as a bit of a planner? Check out the best strategy games on PC. According to Skylines’ developer Paradox Interactive, however, that’s exactly what planners in Stockholm are proposing, using a two day workshop playing the game at the start of September to “explore possible methods for this district to become sustainable, and versatile enough to support the needs of its residents.” Hmm. In just what capacity Cities: Skylines will be used (besides planners using it to mess around in their coffee break) is being left a little bit up to the imagination, though Paradox claims Stockholm’s planners will involve the game’s players from across Sweden and, indeed, across the world. 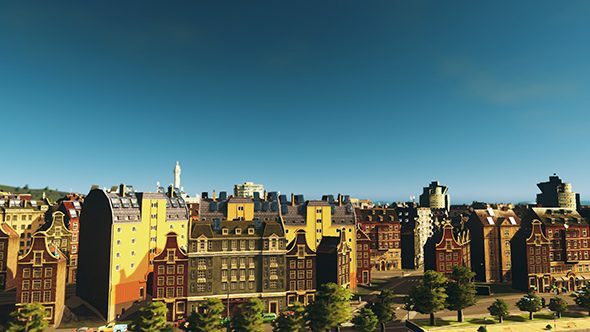 “One of the most active modders in this project, Alexander Oberroither, will fly from Austria to Stockholm to personally take part during the workshop,” the publisher claims, noting that the project has been organized by Swedish Building Services, Svensk Byggtjänst, alongside officials from the city. This all smells like a little bit of buffed up PR to me, although it’s certainly true that the region in question – Stockholm’s Norra Djurgårdsstadendistrict- is a major brown field redevelopment area of the city, with an aim to develop at least 10,000 dwellings and 30,000 workplaces by 2025. According to Paradox, the area has been remodelled within Cities: Skyline in order for planners to simulate population behaviour and needs long term. In short, it seems the game will be used to see if existing plans for Norra Djurgårdsstaden will be fit for purpose in the future. If nothing else, future residents of Norra Djurgårdsstaden will know exactly who to blame if the district ends up being a no go area in the years to come. Personally, I’m waiting for real life driving tests conducted in Gran Turismo, and martial arts training in Shenmue. The sooner I never have to leave my sofa to lead a full and active life, the better.